Raumfahrt+Astronomie-Blog von CENAP - Blog: Raumfahrt - The coming rise in private spaceflight is prompting growth in space companies that give citizen astronauts the know-how they need to fly. Atrip to space is no vacation. Getting there requires some serious prep work—even for people whose checkbooks have paid for the golden launch ticket. SpaceX, Blue Origin, and Virgin Galactic are all promising to send private citizens into space within the next five years. In September, SpaceX announced that its first private paying customer will take a trip around the moon in 2023. Blue Origin founder Jeff Bezos has said he is aiming to send tourists to space by next year. And Virgin Galactic founder Richard Branson recently claimed that his company would send people up before Christmas. Meanwhile, the Russian Space Agency has already taken multiple paying individuals to space. It’s seeming increasingly likely that more private citizens will be heading there soon. No wonder so many firms have spotted a potentially lucrative gap in the market: services to help astronauts prepare for launch. This article also appears in Clocking In, our newsletter covering the impact of emerging technology on the future of work. Sign up here—it’s free! Pletser fetching and installing a simulated payload during a training session at the European Astronaut Centre neutral buoyancy training facility in Koln, Germany. He will train astronauts on things like moving in zero gravity, performing simple experiments, and exercising in space on longer trips. 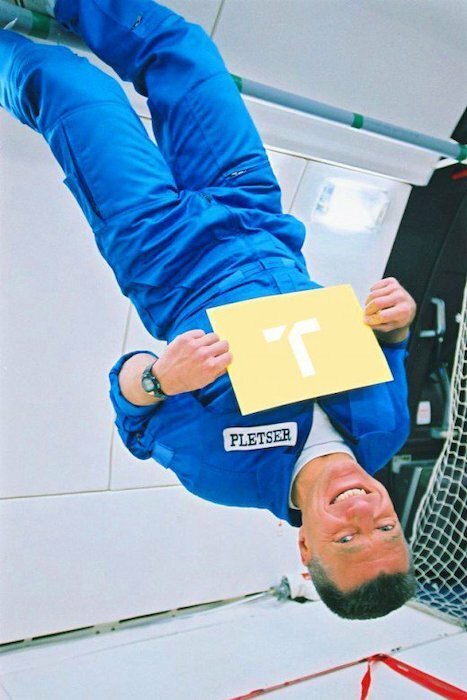 Pletser’s citizen astronauts will dive in pools to practice motion in zero or moon gravity, sit in centrifuges that simulate G-forces, and go on flights that provide a microgravity experience , similar to some of the training government astronauts undergo as well. Pletser during his 1995 medical examination at the Spaceflight Medical Clinic during selection for the Spacelab mission. There’s a hint of play-acting here: Pletser thinks part of Blue Abyss’s business will come from people footing multimillion-dollar bills who want an advance training “experience.” But astronaut trainers will actually be needed to get even a suborbital traveler up to speed on things like emergency procedures, how to move safely, and how any experiments to be performed will work in microgravity. And Blue Abyss isn’t the only organization already hiring astronaut trainers. The National Aerospace Training and Research Center offers FAA-approved suborbital and advanced space training programs. So what qualifications do you need to train people for space? For Pletser, it was going through training himself. He is no stranger to astronaut training and the competitive astronaut selection process. He was first selected as an astronaut candidate by Belgium in 1991 but was passed over at the end of the European Space Agency’s selection process. He then applied to be a NASA payload specialist in 1992 but, once again, had no luck. In 1995 he made it further than before, when Belgium presented him as a candidate for a Spacelab shuttle mission and he passed medical inspection. After two months of training, though, it happened for a third time: he was told he wouldn’t be on board the space shuttle. Pletser performing a series of experiments during a parabolic flight in a glider over Europe. Although he has never reached space, he has spent more than 39 hours weightless. Before coming to Blue Abyss, he had more than 30 years’ experience performing research for the European Space Agency on parabolic flights that simulate microgravity. He has flown more than 7,300 parabolas on 12 airplanes, a Guinness World Record. He is using this experience to design Blue Abyss’s flight training program.